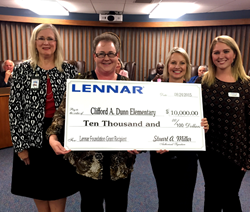 On Tuesday October 20, 2015, Lennar, a leading builder of new homes in Houston, presented a $10,000 grant from the Lennar Foundation to Dunn Elementary, a Title 1 school they have partnered with since 2013. Our associates have been captivated by the students and staff of Dunn Elementary. Working with limited resources, they overcome multiple challenges and accomplish many goals throughout the school year. On Tuesday October 20, 2015, Lennar, a leading builder of new homes in Houston, presented a $10,000 grant from the Lennar Foundation to Dunn Elementary, a Title 1 school they have partnered with since 2013. The partnership began as part of Lennar’s Focused Acts of Caring initiative through which Lennar Associates around the country work together to address the ongoing needs of the communities in which they live and work. Dunn Elementary serves over 1,110 students from kindergarten through fourth grade, 82% of which are economically disadvantaged. The school was established in 1986 to provide an enriched educational environment through which the students can expand their academic abilities regardless of diverse socio-economic and cultural backgrounds. The Lennar Houston team sponsored various programs with Dunn Elementary throughout the year, the first of which was an Art Contest in the spring of 2014. Students from each grade submitted artwork based on their interpretation of the school’s motto “Teamwork Makes the Dream Work!” Ribbons were presented to the 1st and 2nd place winners from each grade. In May 2014, five Lennar Houston employees from various disciplines volunteered their time and presented at Dunn’s career day discussing potential careers in the homebuilding industry with the students. In July 2014, Lennar remodeled the school’s front office space. Despite an increase in office employees fueled by the school’s growing enrollment, the office layout had never been updated due to limited resources. Lennar provided more spacious desks and cabinets, updated wall paint, and new mini blinds. The winning artwork from the spring contest was also framed and displayed. The office staff was grateful for the transformation, and the positive atmosphere has benefited the students. In the summer of 2014, Lennar hosted a school supply, uniform, and backpack drive. Employees from Lennar donated more than enough supplies and uniforms for all students in need. Lennar Houston ended 2014 by sponsoring the families of three Dunn Elementary students who had applied for assistance through the Aldine School District to provide their children with Christmas gifts. Using “wish lists” supplied by the families, Lennar’s employees created a giving tree with gift tags for each item to be wrapped and presented to the children and their parents. Additionally, the associates donated grocery store gift cards to surprise each family with over $200 to purchase their holiday meals. For the 2015-2016 school year, Lennar Houston hosted two teacher appreciation events and wrapped up their third annual backpack, school supply, and uniform drive in August 2015. They plan to sponsor additional families for Christmas gifts this December. The Lennar Foundation was created in 1989 and its primary mission is to find organizations that assist individuals who are less fortunate by providing an avenue for them to enter into the mainstream of society. Each year, Lennar donates one percent of its after tax net profit to the Lennar Foundation. The Lennar Foundation then contributes at least 50 percent of the funds it receives each year back to the Community.